The suspenseful tale of love and murder, by an acclaimed writer at the top of her game, offers a taut psychological mystery whose answers lie hidden until the final pages. Brett had been in love with Charlie from the first day she laid eyes on him in college. When Charlie is brutally murdered, Brett is devastated. But, if she is honest with herself, their marriage had been hanging by a thread for some time, especially after Charlie had an affair. The recent reappearance in their lives of his unstable younger brother, Eli, further strained their relationship until Brett, ever steadfast in her devotion to Charlie, began to question her own commitment in the days leading up to his death. Though all clues point to Eli, who's been in and out of psychiatric hospitals for years, any number of people might have been driven to slit the throat of Charlie Moss-the handsome, charismatic man who unwittingly damaged almost every life he touched. Now, looking back on their lives together, Brett is determined to understand how such a tragedy could have happened-and whether she was somehow complicit. 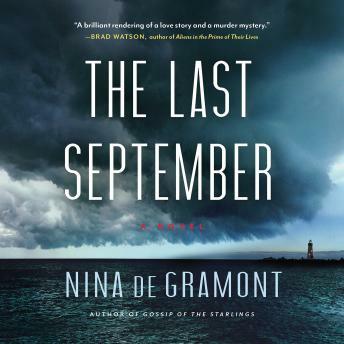 Set against the lush yet desolate autumn beauty of Cape Cod, The Last September is a riveting emotional puzzle. Award-winning author Nina de Gramont takes readers inside the psyche of a woman facing down the meaning of love and loyalty in a mesmerizing novel that is as moving as it is unpredictable.